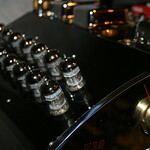 I have been without my Sunfire Classic Vacuum Tube preamp for almost two months. At the beginning of the year I had spoke to Peter Ledermann and his service manager Mark of SoundSmith about upgrading parts in my preamp to higher quality ones. I emailed them the schematics (thanks to BrianT) and said they could make it happen. So I waited to mid April when the weather got better and took the drive to Peekskill NY. Mark ran the preamp, tested everything and called me with his thoughts and a price. I gave him the go ahead. Today I picked up my preamp. I got home hooked it up , started playing some music (at this point I wasn't really listening I wanted it to warm up) . After about a good hour I sat down in my listening spot. I am a happy man!!!! My preamp is more transparent than before and instruments sound more natural. It's not a night and day thing but still very easy to hear. I expect it to improve more as the days go by. Here are some before and after pictures. That's good enough news to make a guy jump for joy. Make his tail wag AND lick a few hands!! Looks like they did a good job of fitting the components to the space too. And avoid the temptation to throw parts at every component there. Only the key ones. Please share more impressions as it breaks in. radioeng2 wrote: That's good enough news to make a guy jump for joy. Make his tail wag AND lick a few hands!! Thanks Mark! The SoundSmith Mark was only concerned with components in the signal path. He said he could have went with what he described as "boutique" parts but he felt his selections offered the most return for the money. Here's another picture of the phono board. Nice looking work, from what I hear Soundsmith has their ducks in a row. Congrats Snoop....enjoy the music! That really looks great Vance!! Looks like they did an outstanding job. OK, what did this upgrade cost? helicopterpilotdoug wrote: That really looks great Vance!! Looks like they did an outstanding job. OK, what did this upgrade cost? I don't know Mike, he didn't mention them but they do look like they were changed too. If I can find out I'll let you know. looking good Vance! how's it sound? Magnaryder wrote: looking good Vance! how's it sound? Clearly a improvement. More transparent and instruments sound more natural while maintaining the original strengths like the large soundstage. I expect it to improve more over the next few weeks. Makes me want to roll some tubes too. Right now I have 3 Amperex Holland made 7308's in the line section, 3 Orange Globe Amperex 6DJ8's , 1 Siemens 6922 and 2 Mulland 10M 12AX7's.